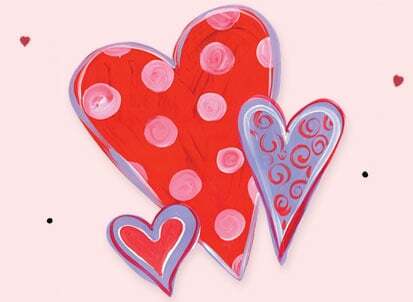 Share love and laughter with Valentine's Day Cards from Leanin' Tree! Say "I Love You," or "Be Mine" in an extra-special way with a sentimental, cute, or fun happy Valentine's Day card from Leanin' Tree! Whether rekindling an old flame or celebrating a new romance, you'll find the perfect card from our delightful new selection of unique cards for Valentines Day. Choose from Funny Valentine's Day Cards, Romantic Valentine's Day Cards, Christian Valentines, and more! Or create your own one-of-a-kind cards using your own photos and messages when you choose our Personalized Cards — just look for the pencil icon !